Let's delve into convertibles and discover what Graham thinks of them. First, what are convertible bonds, convertible preferred stocks, and stock-option warrants? Convertible bonds are debt issued by a company, similar to regular bonds. However, convertible bonds can be converted into common shares. There are specific rules that apply to these conversion privileges. These rules govern the timing, conditions, and conversion rates (that is, the ratio of bonds that can be converted to a certain number of shares). Convertible preferred stocks are preferred stocks with a convertible feature. Preferred stock holders receive dividends. Convertible preferred stocks carry conversion privileges that allow owners to trade preferred shares into common stock shares. Stock-option warrants are options written by the issuing company rather than a third party. They give holders the right to buy common stock at a certain price under specific conditions, generally for a much longer time frame than regular options. They may be issued as stand-alone products, as part of a package with another security, or as part of a deal associated with a merger or other corporate action. As an example of convertibles (in this case, longer-term notes similar to bonds), here's an announcement by Citrix explaining the deal offered to investors. Based on my reading, the terms of the deal can be changed by the issuing company as its needs change. Graham says claims about convertibles indicate they possess the best of both investing worlds: 1) the predictability of income through interest or dividend payments and 2) the opportunity to participate in stock-market gains. They're also described as “win-win” for the issuing company and investor. He contends that the convertible agreement can't be a great deal for both parties. In addition, he argues that the convertible privilege is often offered in exchange for accepting less in income or lower quality in securities. A simpler way to invest: buy a better bond, perhaps one with a higher yield or better quality (with lower likelihood of losing value) OR purchase shares of common stock at an attractive price. In practice, Graham noticed that many convertibles were most attractive for conversion when underlying stock prices rose. This increase signaled an opportune time for investors to convert bonds or preferred stock into shares of common stock. This occurrence also made the bond more valuable in terms of selling price. However, because the stock price had risen, getting common stock at this time often meant share prices were overvalued or unlikely to grow in value significantly. So, converting the bonds at this time, or simply holding the bonds, portended an impending decline in investment value. Further, convertibles muddied the waters in terms of financial reports. Specifically, additional common shares — made available through the conversion process — dilute earnings per share (EPS). Financial statements today typically display diluted EPS. But this information was not readily available in Graham's day, potentially misleading investors regarding stock valuations. In regard to warrants, Graham calls them “a near fraud, an existing menace, and a potential disaster.” One of the problems he detects with these investments is the lack of a ready resale market and appropriate pricing. Warrants may be attached to bulletin-board or over-the-counter stocks, which are often difficult to sell. In addition, because intelligent investing involves paying the right price, the inability to determine a good price may logically deter investors. In the commentary, Jason Zweig brings readers more current information as well as historical data on performance. He mentions that most convertible bonds are now medium term, half are investment grade, and some offer call protection, characteristics that may benefit the investor. Note that performance of convertible bonds as reported was determined partly by studying mutual-fund performance. It doesn't include sales charges, which would likely diminish an individual investor's returns. In addition, it's not clear whether the defensive investor could have duplicated these results by holding a convertible bond index fund or whether any of the convertible issues were converted to shares of common stock and then sold. Without consideration of fees, the convertibles performed better than conventional bonds but not as well as stocks during this time. Actual performance returns after fees may have been much lower, if you invested during this time. Today, you can buy mutual funds and ETFs comprised of convertibles. For example, Vanguard Convertible Securities Fund (VCVSX) and SPDR Barclays Capital Convertible Bond ETF (CWB) are available to regular investors. 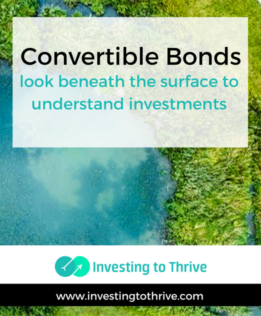 Both Zweig and researchers indicate that convertible bonds may be desirable for investors who prefer to hold bonds only or must hold bonds only, such as certain institutional investors. They can enjoy income from bonds but potentially benefit from capital appreciation associated with stock-market gains (stock price increases may cause bond prices to rise also, as convertibles may become more valuable when the common stock they're associated with increases in value). My take is that determining attractiveness may be trickier than determining a common stock's value, one reason that Graham seems to be discriminating in choosing convertibles and may generally prefer leaving this type of investment alone. A bigger lesson is to truly evaluate the investment, not simply accept a seller's word for its value.